Just because Tom Candiotti threw a knuckleball, it didn’t mean he always threw wild pitches, walked tons of batters, and gave up plenty of home runs. Candiotti nearly won the 1991 American League ERA title (finishing just three-hundredths of a point behind league leader Roger Clemens) and led the majors in earned-run average going into September 1993 (before ultimately finishing seventh in the National League). In fact, over a five-year stretch from 1991 to 1995, Candiotti had the eighth-best ERA in the majors with his 3.21 average during that span. For a full decade from 1986 to 1995, he had a respectable 3.44 ERA despite throwing that knuckleball as his primary pitch. Six times in his career, Candiotti was in the Top 10 in his league for allowing the fewest home runs per nine innings, including an American League-best 12 homers in 238 innings during the 1991 season. He never led his league in walks and was in the Top 10 just twice (1986 and 1994), meaning he had better command of his knuckler than a lot of hard-throwers did with their fastballs! Candiotti has said jokingly in the past that an umpire wouldn’t call his knuckleball a strike if it has too much movement and accidentally hits the ump after the catcher misses the pitch. Umpires might not have called Candiotti’s pitches as strikes if those balls hit them, but what were they supposed to do if they were indeed right in the strike zone? On May 14, 1989, Candiotti threw 131 pitches in defeating the Detroit Tigers 8-3, tossing 8.2 innings. That night, 83 of his pitches were strikes, with 34 of them called strikes. He faced only 34 Tigers batters in that game, and 34 called strikes to 34 hitters seemed like a rather high ratio. To put things in perspective, when fireballer Randy Johnson had 20 strikeouts in a game in 2001, he had 20 called strikes to 29 batters faced, while throwing 92 strikes out of 124 pitches. Kerry Wood fanned 20 batters in a game in 1998, and he had 30 called strikes to 29 batters faced, with 84 strikes out of 122 pitches. Roger Clemens’s 20-strikeout game in 1996 had 31 called strikes to 32 batters, and 101 strikes out of 151 pitches. Working behind home plate in the Candiotti game was Larry McCoy. “I guess none of those pitches hit him,” Candiotti jokes. Getting called strikes wasn’t anything out of the ordinary for him. 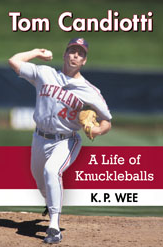 In one game against the Red Sox in Boston in 1991, he received 28 called strikes on 27 hitters in the Indians’ 6-0 win. A few weeks later, he had 26 called strikes on 25 batters in a game against the Mariners at the Kingdome. During a game at Busch Stadium in St. Louis in May of 1992, the Cardinals hitters came out hacking, swinging at his first few pitches to try and make contact. They had never seen Candiotti and the knuckleball before, and had that particular game plan. But they also saw 30 called strikes in that game, as Candiotti dominated in tossing four-hit ball for eight innings while facing 32 batters. Candiotti did it to good teams as well. He beat the NL champion Atlanta Braves twice during the 1992 season, with a total of 58 strikes called in those two starts. The following year, he faced the 1993 NL champion Phillies early in the season, and caused the Phils to swing and miss 20 times and get caught looking another 23 times. The 1998 Yankees, one of the greatest teams of all time, were victimized by 27 called strikes on 33 batters one night that season against Candiotti out in Oakland.